Following up on his winning performances in previous years, Volkswagen's Sebastien Ogier has prevailed in the Rallye Monte Carlo, the 2015 WRC season opener. It is a strong starting point to defend his crown as the WRC Driver's champion. It was the battle of the Sebastiens, as he took on his namesake and fellow WRC title claimer, Sebastien Loeb. The two fought it out as the nine-time WRC champion made another appearance for the Monte. Unfortunately for Loeb, he damaged the left-rear suspension in a test on Friday. Ogier took a commanding lead in SS7, and by doing so made sure he had a fairly uneventful Saturday and Sunday. He eventually won by just under a minute. Probably for the best, as Ogier told the official WRC website that conditions were problematic. Victory in Monte Carlo means a lot - especially for me, so close to my home town, and at the first rally of the season. It is a huge challenge but the satisfaction is even more when you make it. Conditions were so tricky this year, but it has been the best atmosphere I have ever known. The atmosphere has been just magic. 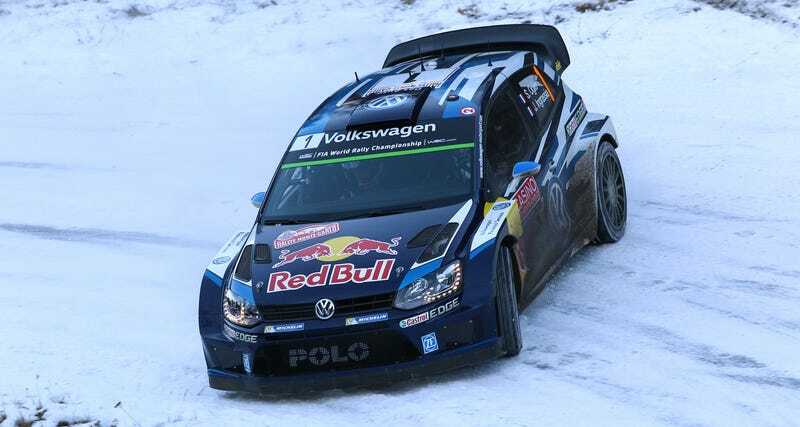 Jari-Matti Latvala came in second place and Andreas Mikkelsen came in third, giving Volkswagen a 1-2-3 knockout, and delivering the first single manufacturer podium since 2003. That was Loeb's time to shine, when he led Colin McRae and Carlos Sainz to a 1-2-3 for Citroën. You can get a list of the full rankings over at Crash.net. The WRC is now headed to Sweden next month, February 12-15, for the only winter event of the season.